This 13m by 5m pool was installed as part of the leisure centre at the first 5 star hotel in York. The pool has a constant water depth of 1200mm, and incorporates feature massage jets. This pool was constructed at a leisure centre that is now part of a major national group. The main pool is 25m long creating the ideal length for exercise swimming. However, as the aim was to create a multi functional pool, we created a large shallow water area to one side for use by toddlers, and a magnificent spa area. The design of this pool was restricted as it was to be constructed within an existing building. After many redesigns it was decided to construct a pool with a main swimming area 15m long by 6m wide, with a section extending a further 9m to one side. As well as the pool we constructed a large spa and installed the sauna and steam room. We constructed this 25m pool at a hotel in the North East. One of the features of this pool, which unfortunately doesn’t show up well on photographs, is the lighting system built into the pool floor. We installed almost 100 lights in the base of the pool, which produce an amazing effect in the pool hall at night. How to fit a quart into a pint pot. It is often the case on commercial projects that space is at a premium, and this project was no exception. However, with careful design we were able to incorporate a pool, spa, sauna, steamroom, and relaxation areas within the room. We were even able to create a toddler’s area within the main pool by raising the floor and installing stainless steel railings. This pool and spa complex was constructed as part of a residential development in the Lake District. We are particularly proud to have won a NHBC award for this project as part of the building team, as well as a SPATA award for the pool. This deck level pool and spa formed the centrepiece of a leisure area at a local hotel. This project also involved the installation of a sauna and steamroom. As an additional feature we installed a massage station within the main pool. This consists of three massage jets set at different heights within the pool wall that allows bathers to massage all parts of the body. We constructed this pool and spa as part of a large leisure extension at a local hotel. The pool was built to a decklevel design, and is 11m long by 6m wide. As shown in the photograph, the steps out of the pool lead up to a circular decklevel commercial spa, set next to the pool. On this project we also installed the commercial steamroom and sauna. This children's pool was constructed by our clients as part of a major leisure development at their hotel in South Yorkshire. The pool was designed with toddlers and parents in mind, and incorporated a children's slide, together with a spa area with gentle jets. 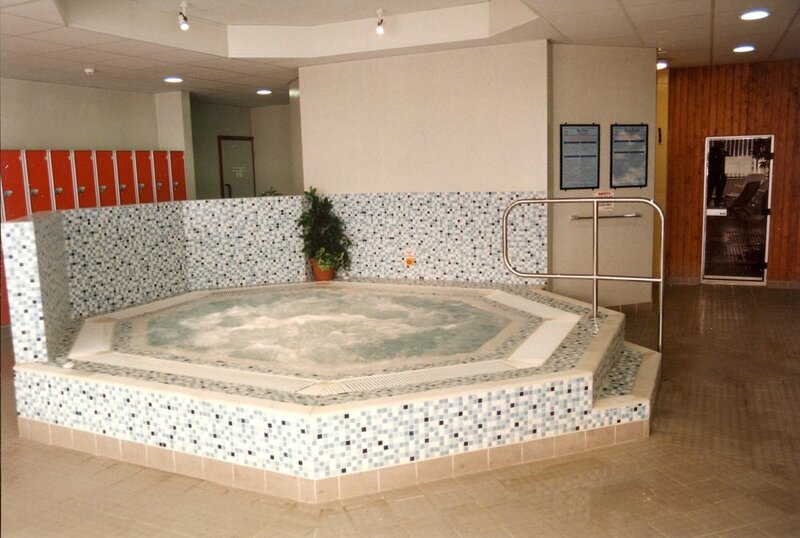 We supplied all the filtration and chemical dosing equipment, along with the equipment for the spa area. Built by our clients, in an adjoining room to their main pool, this spa pool incorporates a range of features, which were supplied by us. We also designed and supplied the filtration and dosing systems. The pool incorporates air-loungers, massage stations, water jets, and a spa area. We constructed this deck-level pool at a family run, award winning, hotel in the North East. The pool was part of a major development including a sauna and steam room, together with a bespoke outdoor spa. All of these were supplied and installed by Lennox Leisure.